NBC Lacrosse Camps is an exciting expansion for the NBC Sports Academy because lacrosse is such a fantastic sport. NBC Camps is pleased to announce that it is expanding to offer lacrosse camps. Lacrosse is a perfect training pairing with basketball to help offset overuse injuries and keep athletes competitive and ready for the season. Lacrosse and basketball share similar strategies, which helps advance basketball talent and vice versa. Also, because of Title IX, the number of college scholarships for lacrosse has increased and NBC Camps wants to help young athletes get scholarships and help parents offset the rising costs of college tuition. 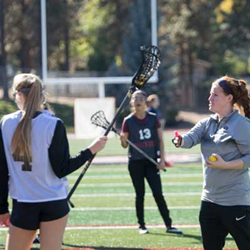 NBC Camps Lacrosse camp will be run by Whitworth University’s new lacrosse coach Noelle Brouillard. Find out more about NBC Lacrosse programs at http://www.nbccamps.com/lacrosse. NBC Lacrosse Camps are affiliated with USSC Sports Camps and Nike Sports Camps. NBC Camp have been in operation since 1971 and have helped train thousands of athletes to be successful on and off the court. NBC stands for Nothing Beats Commitment and the belief that daily habits reveal future success. For more information about NBC Camps visit http://www.nbccamps.com or call 1-800-406-3926.